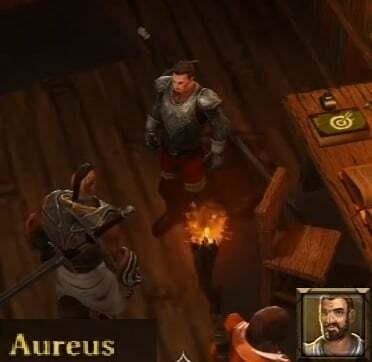 The Undead Scourge is a Side Quest in Divinity: Original Sin Enhanced Edition. This quest is started by speaking with Captain Aureus at the Legionnaire HQ in the City of Cyseal. He tells about his concern for the "undead" problem in the region and ask you to do something about it. Your task will be to deal with the problem before it gets out of hand. NOTE: This will be one of the hardest side quests in all of Cyseal. You will face multiple Level 8~9 bosses at the same time so it is advised you take on this quest at Level 9 or above. Also complete the "LINKED QUESTS" before taking this side quest on. Complete A Mysterious Murder and other "Linked Quests"
The quest begins when you first speak with Aureus about the undead problem in the region. He exclaims his concerns to you and asks you to do something about it. Continuing to talk with him more about this matter makes him give you three more quests --Legionnaires at the Church (Church), The Scaredy Pact (Lighthouse), The Lost Archeologist (Burial Mounds) -- each representing the three places where the undead will come from. At this point you should complete each of the side quests and also the first main quest - A Mysterious Murder. You can only proceed after having completed the quests listed above. After you are ready, head Northeast from the city of Cyseal towards the Church. At the entrance to the church, you'll encounter four Granite Guardians. They will not let you in so you will have to convince them by winning a RPS Game. If you lose to them you will have to fight them and defeat them to continue. These guardians are immune to fire, earth and piercing damage. Defeating them will earn you +6000 XP and a chance to get a Stone Sword. After entering the Church, you will come across a Hooden Man. This main will tell you that Thelyron is the source of all the problems. He will then run down a staircase leaving a few Young Cultists behind to fight you. You will need to defeat them and follow the man. The staircase is blocked by an Altar, which can be moved by hitting the 4 hidden switches behind paintings in the Church. The key to one of the rooms is found in the northern part of the church. You will reach the Ancient Tomb after going down the staircase. There will be a magical barrier in your way. To remove it you will have to use the ( Enlightened Amulet which you received from A Mysterious Murder) with the control panel in front of it. Inside, you will find Zombie Jake standing over [Thelyron]]. Thelyron will immediately admit his deeds -- as part of a bargain he sealed with the Conduit -- and that he even managed to raise King Braccus, the last of the mad source kings. However, Thelyron will tell you that the Conduit was deceiving him, and that he now hopes you can undo the damage he's caused Cyseal. You will also learn that Jake has in fact been working with the Conduit all this while. Thelyron will die and Jake will disappear leaving behind Braccus Rex for you to fight. Braccus Rex will summon Level 8~9 versions of Diederick the Baron of Bones, the Ghoul-that-Guards-the-Lighthouse, and the Twins-by-Fire-Joined -- who you should already have defeated once before. Defeating them all will earn you + 12,000 XP and a bunch of loot. Return to Captain Aureus to tell him about the Ordeal and complete the quest. I don&apos;t know what this is but I&apos;m certain Blizzard will want to sue you for copyright infringement.